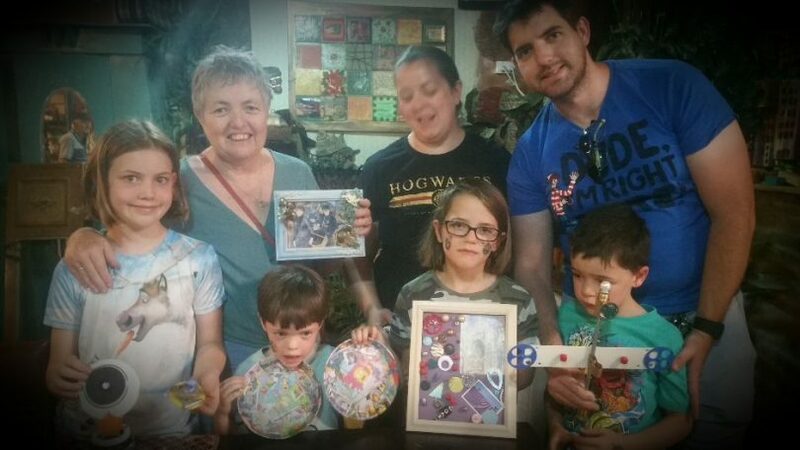 A family’s creative output after working with Candice Addicoat at the Mitchell Green Shed. Photos: Supplied. Where others just see junk, Candice Addicoat sees the potential to transform people’s lives for next to nothing. 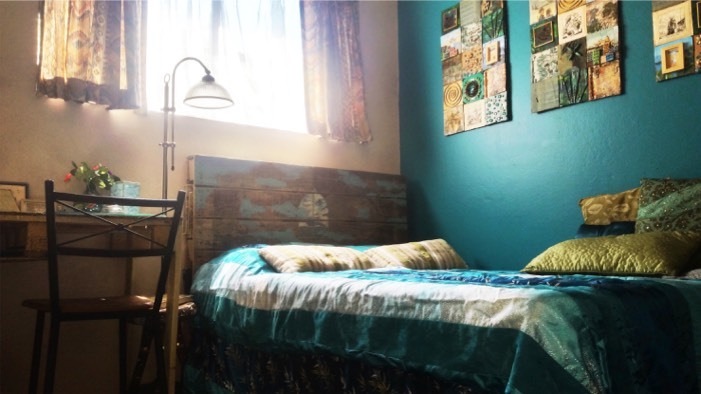 An interior designer, Candice has committed to beautifying the spaces of the less fortunate and proving it can be done cheaply, using second-hand and recycled materials, or anything that catches her eye while walking down the street. Working with unfunded community improvement projects over the past few years, she has helped bring an artistic aesthetic to youth centres and emergency accommodation, or any organisation that doesn’t have a lot of money. Last year in a project for Vinnies, she transformed a run-down ’70s Oaks Estate flat into a Tuscan villa-inspired space for about $10, with donations from Vinnies and The Green Shed. Her work caught the eye of the folk at The Green Shed at Mitchell, where she sources much of her material, and she was offered a studio there to teach people how to make decor out of junk. The result was free workshops for National Recycling Week in November and now her $2 summer Creation & Design workshops pitched at all ages, abilities and needs, and being held at Repsyched! Creative Space @ The Green Shed. “I’ve always enjoyed junk,” says Candice, who aims to make interior design accessible to all budgets. The transformed Oaks Estate flat. For Candice, there is no reason why people should have to live in drab, uninspiring places when, with a little bit of design magic and not much expense, a space could be brighter, more colourful and inspiring. “If you wake up in a room that’s pretty bad you’re not going to be able to think positively,” she says. The workshops have attracted an array of people, from home-school mums and special and aged care groups to young art-and-design students, and home-maker couples. “I’ve only just started here and I’ve got enough names and numbers to start a mobile workshop going to schools, aged care, and special care,” she says. The 12 workshops cover a range of artworks, decor, bags, furniture treatments and even toys, using basic tools. “I look at things on trend and reproduce them in everyday items and junk,” Candice says. The aim is for participants to have fun, learn about recycling and take away something to decorate the home, and some skills to do more. Candice says her workshops are simple but have an impact. “I’ve worked really hard to make all these workshops easy. I’ve fine-tuned steps and techniques and the tools are everyday items,” she says. Her next big project is to help give one of Canberra’s roughest housing complex’s a makeover, in conjunction with Vinnies. She has also been asked to work at Questacon and is looking to collaborate with other recycling artists. But her commitment, for now, is to take interior design to the community as part of her contribution to the nation. “I have spent the last three years just getting out doing projects and getting people used to the story of what I’m trying to achieve,” she says.